Why not sign up for more updates on such events? We apologise for the hiatus, but we are back, and are dedicated to making this incredibly special for all of you - whether you’ve been to one/many/all/none of the previous PWs - You.Are.Welcome. There is a limit to the capacity we can accommodate in this space, so please please RSVP in advance with the above link! If anyone who would like to come along and cannot contribute that amount/has any trouble with it - please write to us. We want this space to always be accessible for you, while making it more sustainable for us too. We are dedicated to creating a safe space, that allows for open expression, discourse, giving and sharing with one another. 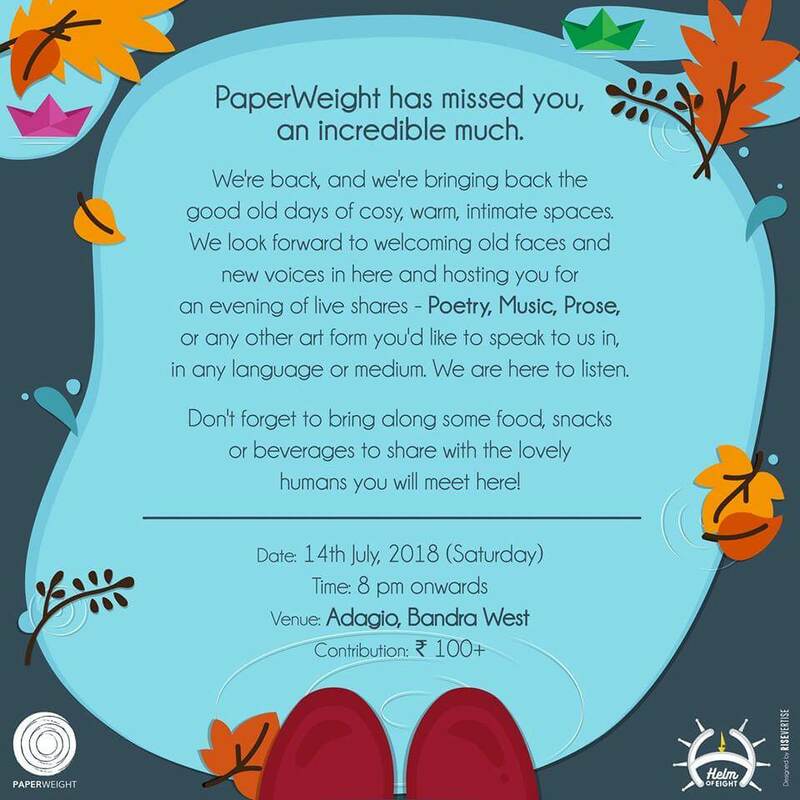 We at PaperWeight encourage a sense of community and sharing in more ways than one - and we encourage everyone to contribute something, so bring some food to eat, some words to share, and a whole lot of heart, to listen, acknowledge, learn and feel. We have hosted 17 heart warming sessions thus far, and can’t wait for another lovely Saturday evening with you all. We look forward to welcoming old faces and new voices in here and hosting you for an evening of live shares - Poetry, Music, Prose, or any other art form you’d like to speak to us in. We are here to listen. We keep an open mind towards all life forms. To preserve the sanctity of the experience, please be on time. If you miss the door timings, please contact us and we will let you in between shares. We are a troop of entrepreneurs, designers, humanists and storytellers, coming together – to build and sustain safer, braver communities.